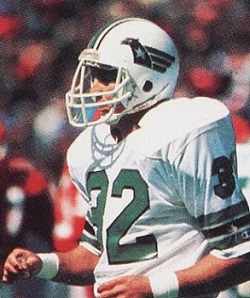 The Michigan Panthers were fighting for a playoff spot in the inaugural United States Football League season as they hosted the Washington Federals on June 20, 1983. The Federals had defeated Michigan early in the season, but the Panthers had undergone changes that improved their fortunes since then. Coached by Jim Stanley, Michigan got off to a 1-4 start (including the loss at Washington) before veteran additions to the offensive line helped fuel a turnaround that had the club at 9-6 and a game behind Chicago and Tampa Bay in the USFL’s Central Division. 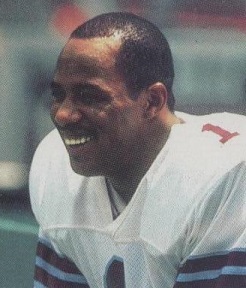 Unheralded rookie QB Bobby Hebert was fast developing into a star and WR Anthony Carter (pictured above), the high-priced first year player out of Michigan, had overcome a slow start to become a potent deep threat. The running game was sound and the defense formidable. The Federals, under Head Coach Ray Jauch, were far less successful and had won only one other contest thus far to linger at the bottom of the Atlantic Division with a league-worst 2-13 record. There was an outstanding rookie in RB Craig James and first-year QB Mike Hohensee was able when healthy, but he was out for the rematch with the Panthers and veteran NFL backup Kim McQuilken was filling in. There were 26,418 fans in attendance for the Monday night game at the Pontiac Silverdome. Early in the first quarter, the Panthers advanced into Washington territory and Bobby Hebert threw to Anthony Carter, who split two defenders on the way to a 37-yard touchdown. Novo Bojovic added the extra point. On their next possession, the Panthers again moved well. Hebert completed passes to Carter for 20 and 10 yards, but after gaining a first down inside the Washington 10, the Federals were able to keep them out of the end zone thanks to good plays by LB Joe Harris and CB Jeff Brown. Michigan had to settle for a 19-yard Bojovic field goal. Down 10-0, the Federals put together a good drive. McQuilken tossed passes to WR Mike Harris, Craig James, and RB Billy Taylor and, facing third-and-one at the Michigan four, he faked a handoff and threw to a wide-open Taylor in the end zone for a TD. Sandro Vitiello missed the point after but the score was narrowed to 10-6. Washington’s next series resulted in a punt from deep in its own territory. DE Ronnie Paggett partially blocked the kick and Carter returned it to the Federals’ 14. A pass interference call and throw from Hebert to Carter that covered 10 yards set up a one-yard touchdown carry by RB John Williams. Bojovic converted and the Panthers were ahead by 17-6 with 1:12 remaining in the half. The second quarter scoring was not yet over, however, as the Federals were able to get past midfield and, on the final play before halftime, Vitiello booted a field goal from 51 yards that made it 17-9. Early in the third quarter, Washington got a break on defense when TE Mike Cobb fumbled after catching a pass from Hebert and SS Doug Greene recovered the loose ball and ran 35 unmolested yards for a TD. A try for a two-point conversion that would have tied the score failed, but Michigan’s lead was narrowed to 17-15. The Federals pulled off a successful onside kick but turned the ball over on a Taylor fumble three plays later. Michigan took advantage, driving to a one-yard run for a TD by RB Ken Lacy, and Bojovic added the extra point. Washington responded with a 74-yard possession that featured the running of James and RB Curtis Bledsoe and resulted in a one-yard scoring carry by James with 6:48 to go in the period. This time Vitiello made good on the point after to again make it a two-point contest at 24-22. That was it for the scoring until the fourth quarter when Vitiello came through on a 45-yard field goal that gave the visitors a narrow 25-24 advantage. But with their backs to the wall, the Panthers put together a 73-yard drive. With 18 seconds left on the clock, Bojovic kicked an 18-yard field goal that provided the final margin in Michigan’s 27-25 win. The Panthers led in total yards (335 to 285) while Washington had the edge in first downs (17 to 16) and time of possession (31:13 to 28:47). Each team turned the ball over twice while Michigan recorded four sacks, to none by the Federals. Bobby Hebert completed 13 of 21 passes for 195 yards and a touchdown as well as an interception. Anthony Carter had 5 catches for 94 yards and a TD. Ken Lacy rushed for 81 yards on 22 carries that included a touchdown and John Williams added 59 yards on 16 attempts that also included a score. For the Federals, Kim McQuilken was successful on 19 of 27 throws for 158 yards and a TD without giving up an interception. Craig James (pictured above) gained 89 yards on 13 rushing attempts and also had 7 pass receptions for 63 yards. The win kept the Panthers even with the Bandits, who lost, and they ultimately finished atop the Central Division at 12-6 (Chicago ended up with the lone Wild Card spot and Tampa Bay finished third and missed the postseason). Michigan handily defeated the Oakland Invaders in the Semifinal playoff round and then edged the Philadelphia Stars to win the initial USFL Championship. The hard-luck Federals managed to win twice more and were 4-14. Kim McQuilken? I remember him once as a hapless backup in Atlanta during Steve Bartkowski's formative years. These game stats were exponentially better than anything he ever accomplished with the Falcons.